An electronic album that is utterly original and not easily forgotten. From Here We Go Sublime is an album not only concerned with space, but more than that -- it is concerned with infinity. For over an hour, the Field (aka Axel Willner) plays with the drone of various sounds to construct music that is constantly expanding. These songs seem incapable of being contained. Even the scant parameters Willner imposes on his compositions are constantly being stretched at the seams. "Over the Ice", the album's opener, builds slowly and deliberately. It starts simply: all thudding beat accompanied by nearly inaudible synth notes. Then, the looped sound of a woman's voice comes in, sounding both robotic and ghostly, setting the tone for what is to follow. The song gradually adds layers of keys and stilted vocals and shuffling percussion. The movement of it is beautiful, pushing the song both to its absolute limits and the only possible place it could go. The entirety of From Here We Go Sublime sounds like that. Like both a challenge for Willner and an inevitability. And perhaps what is most impressive is Willner's confidence in the face of such ambition. The production always sounds under control, never forced. He manages to incorporate basic electronic elements -- like, for example, heavy sampling -- without calling attention to them. Most of the samples here are looped woman's vocals, usually cut to one simple note and repeated over and over. And each time he uses the trick, it works. On "The Deal", perhaps the most epic of all these epic songs, the sampled vocals raise the stakes of the song, and consequently the album. The sample gives the song a choral feel, like something one man couldn't possibly have created himself. It drives on, taking its time and drawing the listener in with its choir of angels sound, for 10 minutes. By the end, the trajectory of the album is cemented. 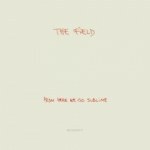 From Here We Go Sublime reveals a pretty brilliant structure in which the album seems to move vertically as it goes. I don't know if it's format -- disc or vinyl or cassette alike -- but most music comes across as moving horizontally, from beginning to end. But the Field moves north without a doubt, pushing the borders as it goes, to create something quite vibrant. "Sun & Ice" may be the album's zenith. Following the amazing "The Deal", the song soars as sounds swell and circle back around to swell and rise again. It is a song -- like many of these songs -- that earns every moment, not giving the listener the lift the song provides, but making them participate and pay attention to the elements of the track. And just when you're into the rhythm, the song shorts out for a second nearly six minutes in. It's a big enough blip to make you raise your head and look at the stereo with concern. And, just as quick as it came, the Field picks the track up again, making you realize just how much you'd invested in the album to that point, how disappointed you'd be if it went away. Willner has never been shy about his love for shoegaze, and he achieves another small success on this album by incorporating that influence into his music and making it his own. As with My Bloody Valentine, the melody is not always immediately apparent in the Field's music; it is buried down in the songs a little and the listener has to work to pull it out. And like the best in shoegaze (which, for my money, is Slowdive), the songs get better with repeated listens, revealing small surprises hidden in the murk. So it is with the Field, and Willner manages to avoid letting the atmosphere, the drone and fuzz of feeling, take his songs over. He uses that influence the way it should be used, sparingly, and uses it to his greatest advantage. With From Here We Go Sublime, Willner has crafted an electronic album that is utterly original and not easily forgotten.